Meet the most intelligent person to ever live: an unpredictable maverick whose mind is his super power, with the ability to unlock universes we've only dreamed of. Try to keep up with his journeys through space, time, alternate dimensions and everything in between, as he explores the furthest reaches of our imagination. 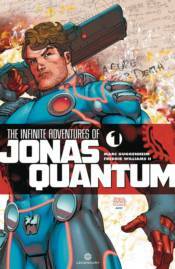 His ingenious inventions and creations are centuries ahead of their time - but is the world truly ready for Jonas Quantum?